The Arogya Vikas Kendram across the country conducted number women’s health camps and provided free health tests to otherwise expensive tests that come at unaffordable prices. Most health camps run a single round of tests, but the camps organized by the Arogya Kendra, under the blessings of HH Swamiji, conducted the follow up tests too, thus benefitting the patients greatly. The Women Health care camp organized by Smt. Sakunthala on 20th August 2017, has seen a great response. Mr. Sridhar, procured and distributed required medicines in the camp. Smt. Leela Raghav from Anganwadi Cancer Hospital participated and conducted the Health camp. VikasaTarangini Seva successfully conducted the advanced medical procedures like Biopsy and Cryotherapy. Similarly on 27th of August, The Women’s Health Camp organized by VikasaTarangini Seva, could see a participation of 62 women taking VIP Test. Dr. Santhosh Kumari actively took up services at the health. Mr. V Kishore took upon himself to provide the medicines required at the camp. The Vizayanagaram Arogya Vikas team has debunked the distance aspect and conducted the health camps with great dedication and care not only in Vizayanagaram but also in Vizag, Srikakulam and all the areas nearby these places. Smt. Sakunthala, attributes these efforts to the Mangala Sasanams of HH Swamiji. On 20th July, in KPHB colony, the health camp conducted by Remedy Hospitals saw a huge response. 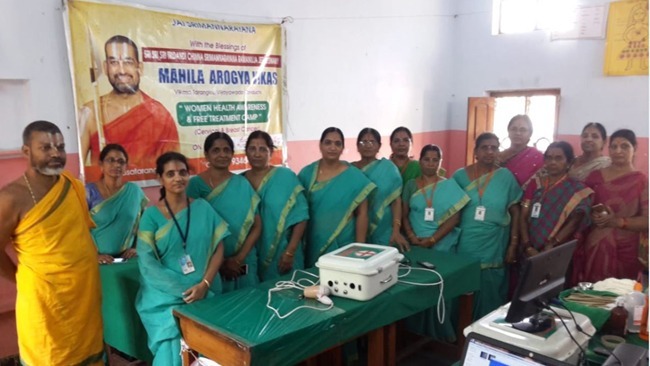 On 3rd September 2017, the Women’s health camp conducted in Serilingampally saw a huge response. Dr. Seetha, not only extended her services here, but also counselled the attendees about good health practices. Mr. Vijaya Kumar provided the required medicines to the camp. The VT Seva members who devotedly participated in the camp were, Ms. Sunitha, Ms. Padmashri, Ms. Usha Rani and the team. Of 58 people who took the services, 47 people enrolled for a VIP test. On 17th September 2017, The Women’s health camp was organized at Vasavi Club. Of the 102 women enrolled, 85 members took the VIP test. In the second run of the test, one woman underwent biopsy. 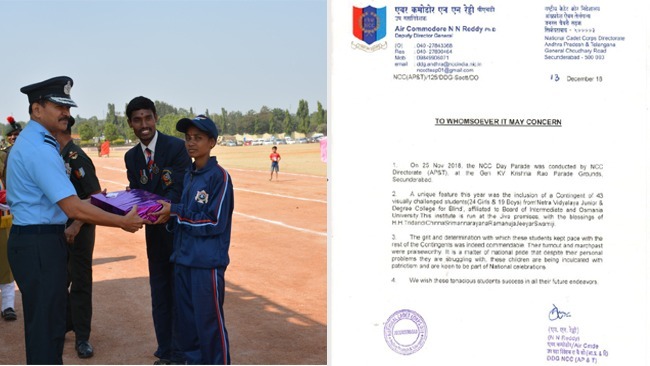 The Vasavi Club presiding members, Mr. Venkatesh, Mr. Sai Prasad and the treasurer Ms. Vijaya made sure that the arrangements at the club were adequate for the camp. 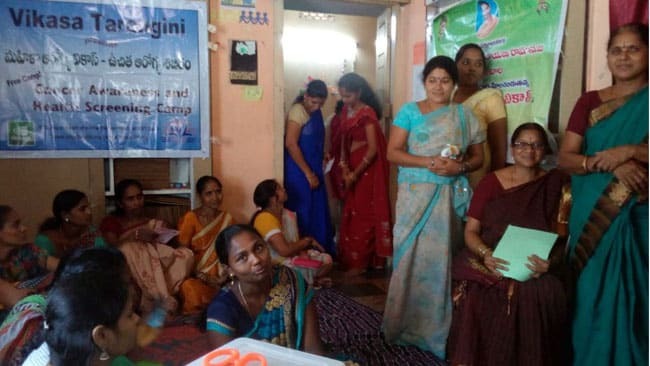 The Arogya Vikas coordinator Ms. Sunitha yet again extended an unparalleled effort to conduct a survey of 200 people and brought about great services. On 9th September 2017, the women’s health camp was conducted in Nepal. Of the 48 women enrolled, 16 members took second round of tests and got the required medication. Since 2010, The Arogya Vikas has conducted about 36 women’s health camps in Nepal. A total of 4923 women have enrolled and took the services. The women behind such a prodigious effort are Ms.Uma and Ms. Lakshmi were trained in JIMS hospital, Hyderabad. On 3rd September 2017, at the HH Swamy Ashram, women’s health camp was conducted. Of the 117 people who availed the services, 96 women took the VIP test. Eminent Ayurvedic doctor, Smt. Prasanna Lakshmi extends her services to the Ashram on the first week of every month with great enthusiasm. 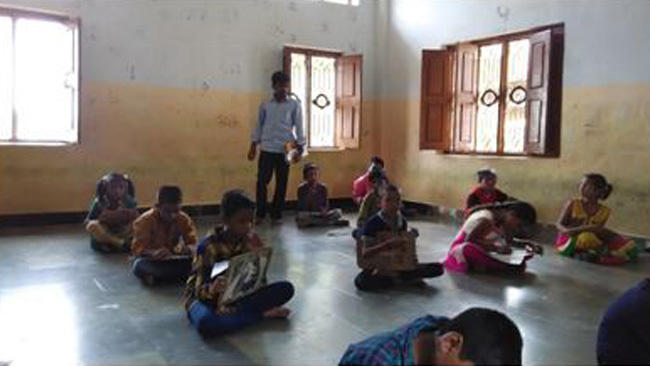 Ms. Madhavi Ravindra and team takes up survey in the surrounding areas every month and organizes the events. At the Women’s health camp, a dental test was also conducted with the help of Dr. V. Chandra. 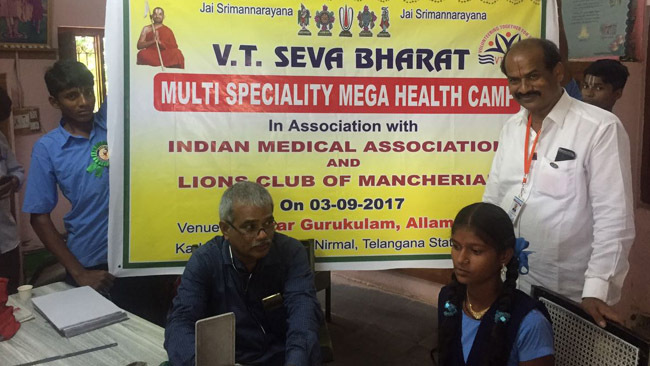 With the help of Sriman Srinivasacharyulu, the Veda Patashala students and women got a free dental check-up. 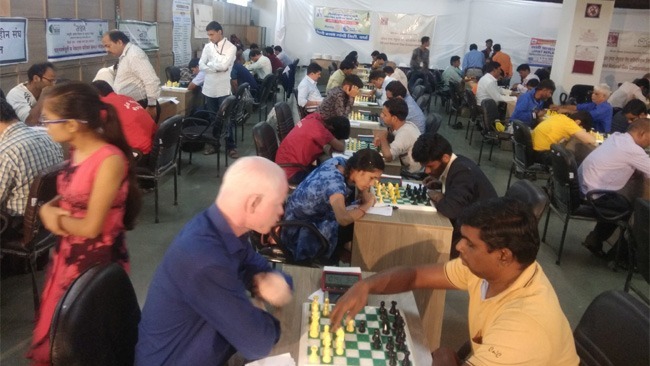 Bengaluru resident and an active VT Seva member Ms. Usha Jagadish and Mr. Venkatachary also contributed their dedicated efforts towards the cause. On 6th September 2017, At the HH Swamiji ashram, a talk was organized witnessed by the girls from Netra Vidyalaya coordinated by the members of Netra Vidyalaya. The event was convened by the Central Contributor of Arogya Vikas, Ms. Madhavi Ravindra. As part of the event, the girls were counselled about the good menstrual health and practices. Many students enthusiastically participated and spoke out about problems that they were shy to talk about. Not only did they participate, they also pointed out to their elderly women living in the remote villages.